This side chair, likely owned by William Blanding (1747–1830) and his wife, Lydia (Ormsbee) Blanding, of Rehoboth, adapts a design created in England and soon embraced in Philadelphia, New York, Newport, and Providence. Prominent features include a rococo scrolled splat, pairs of deep gouges on the ears of the crest, and broad flutes on the front legs, which end in tapered feet. 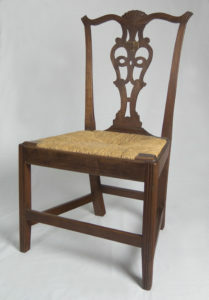 According to furniture scholars, it is uncommon to find a side chair from this period in such excellent condition. It retains its original red stain finish, the pins holding the joints are intact, and the unusual front legs have not been modified. The chair was donated to the Rehoboth Antiquarian Society soon after its formation in 1884 by its first treasurer, William Willett Blanding. A bachelor dairy farmer living at 103 Broad Street, Blanding inherited and preserved many of his prominent family’s possessions, including those of his grandfather William Blanding, a Revolutionary War veteran, and his uncle Dr. William Blanding (1773–1857), a well-known physician and naturalist who recorded and described early Rehoboth structures in his 1848 sketchbook of childhood reminiscences. Other gifts by William Willet Blanding include his grandfather’s pipe box, a boot jack, a pewter teapot, and his uncle’s apothecary balance scale.